We knew there was a pretty slick carrier promotion for $300 off via trade-in running, the T-Mobile version would be single-SIM with only one storage configuration (8GB/128GB) available, and we were told at the time that the software wouldn't force carrier apps on users, making them an option during the setup process. 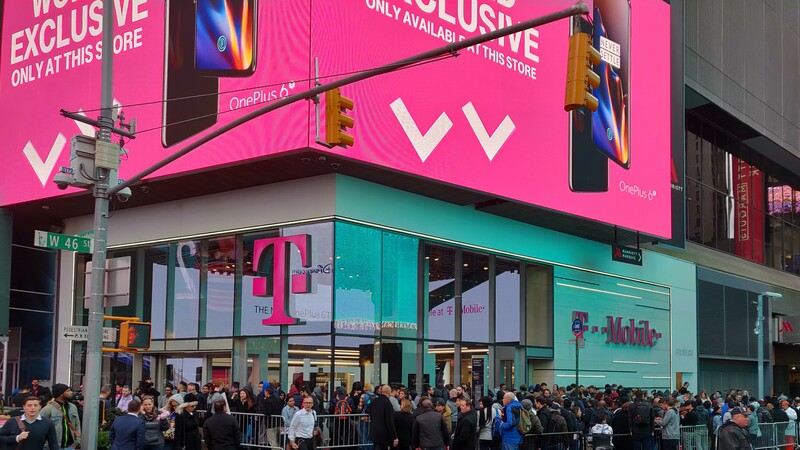 Still, at the end of the launch event, plenty of questions remained unanswered, even as sales opened via the T-Mobile store in Times Square. According to the information released, T-Mobile versions of the phone will be carrier and bootloader locked as expected, but a mechanism for their unlocking is described. Once devices are paid off in full and utilized on the network for at least 40 continuous days, they can be carrier unlocked, at which point you can request an unlock token for bootloader unlocking from OnePlus. The phone can also be paid off early even if you elect to use the payment plan for the $300-off promo, and bill credits will continue to be received. The software update schedule for the T-Mobile version is likely to be delayed compared to its unlocked cousin. Although OnePlus promises bi-monthly updates for the 6T, the T-Mobile version won't necessarily get them at the same time. "Due to the additional level of certification required by T-Mobile on all software releases, there may be a slight offset but we are working diligently to minimize this period in all instances." Lastly, if you were considering moving to the Beta Program on your T-Mobile locked OnePlus 6T, that won't be an option — though it isn't clear if that's a result of the locked bootloader, and therefore capable of circumvention once paid off or not. Reports also indicate that some T-Mobile apps may not, in fact, be optional parts of the setup process. Apparently, both the T-Mobile and "Unlock" apps (the latter describing the unlock process detailed here) are preinstalled regardless of what you choose, though the Name ID and Visual Voicemail apps are optional things you can select during setup. A previous version of this article stated that the Name ID app was preinstalled and not an optional part of the setup process (as we were first led to believe). That was incorrect, both it and the Visual Voicemail apps are options at the time of setup, though the T-Mobile and Unlock apps are both preinstalled. Based on recent reports, some have finagled an early unlock from the carrier, but it appears to be discretionary. T-Mobile's support is technically able to unlock the phone before the typical 40-day service obligation, but there are no guarantees. Some reports have indicated that the longer you've held your account, and the longer it's been in good standing, the better your chances. If you need an early unlock for travel or other reasons, you'll have to ping T-Mobile's support yourself to see if it's possible.